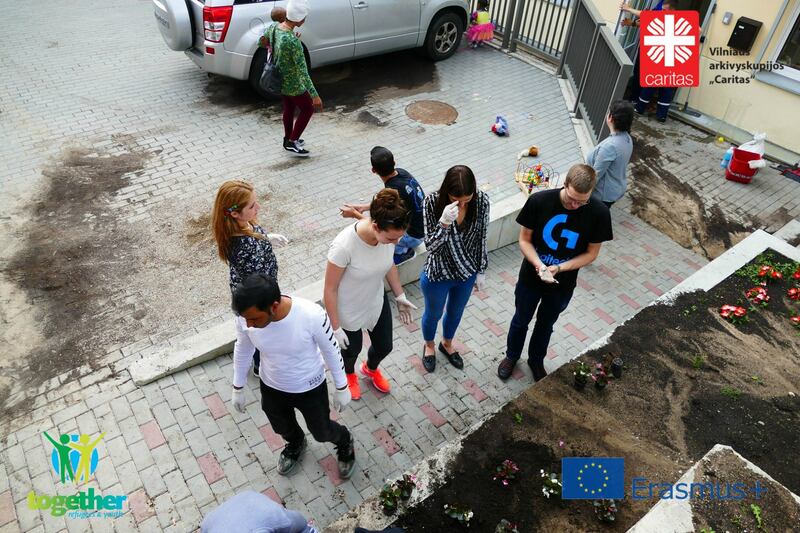 On 12th of July refugees discovered their green fingers by taking part in Garden Day organized in partnership with VA Caritas Užsieniečių integracijos programa. When you get sun-drenched, your hands dirty with damp terrain, sowing flowers, your soul gets in touch with nature. The Garden Day hosted at .VA Caritas was a great chance for refugees to get closer to the land they are currently living in: by planting wax begonia and white cedar in a public space, they were feeling part of the community. Everytime they'll pass through "their garden" they'll see their plants growing and putting down roots. Just the same as they are: taking roots in a new country and build a new future. Even children wanted to join in with gardening: after playing a little bit with coloured chalks they felt curious about planting and wanted to play a role in that. After all the work was done, new flowers and plants came to life on the tarmac through beautiful drawings made with chalks.